This cream-colored root vegetable may grow like a carrot, and look like a carrot, but make no mistake: the unassuming parsnip is in a class all its own, with a subtle sweetness that draws in even the most discerning palate. Parsnips have been known for their sweetness even before the vegetable was introduced to the United States in the 17th century. Native to Eurasia, parsnips have been used in many different ways across that region since ancient times — most commonly as a sweetening agent for food before cane sugar became available. The sweet taste of the parsnip comes from the starch that is converted into a subtle natural sugar. The prime planting time for parsnip seeds is in the summer months, and it can take half the year for the parsnip to mature. 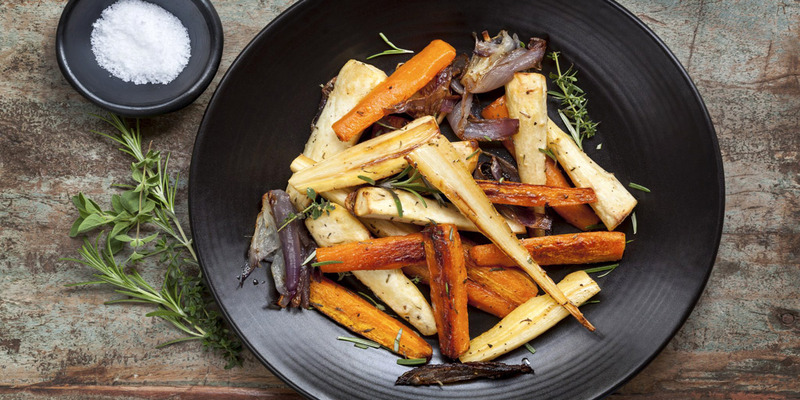 But it’s always worth the wait because parsnips are nothing short of delicious – and healthy. Along with high levels of vitamin C and magnesium, parsnips also lower the chances of diabetes, high cholesterol and high blood pressure, and they improve digestion, and strengthen the immune system. Parsnips can be enjoyed in a number of ways. Typically, they are cooked but can be eaten raw as well. When preparing parsnips, it is important to wash them under cold water and then peel or scrub off the thin layer of skin that unlocks their true flavor. They are delicious baked, broiled, and mashed, but our favorite way to prepare them is to simply roast them with a splash of olive oil and a dash of salt so their natural sugar can caramelize during roasting. One of our favorite winter recipes is a curried parsnip and apple soup, where the distinct taste of curry compliments the pureed sweetness of the parsnips and apple combination.